Chrome Media Group provides printing, promotional items, event signage, and warehousing/fulfillment services for organizations seeking to be seen and remembered. Efficiency is the guiding principle behind all the work we do. Our experience, responsiveness and personalized attention enable our customers to focus on their businesses – not on the execution of their promotional plans. Our customers simply tell us what their promotional requirements are, and we deliver creative, affordable, tailor-made solutions. They don’t waste time chasing down quotes for products and services. They don’t waste time monitoring the status of shipments to make sure they will arrive on time. Our customers rely on us to effectively handle all the details, on time and on budget. Explore our areas of expertise below. We look forward to working with you! We use state-of-the-art equipment to deliver our high-quality printing services. If you need to do a large run of mailers or promotional flyers, we can save you money by using our offset press. Maybe you need to get a small number of collateral pieces printed in a hurry, our digital press can quickly produce orders like that. We also provide die cutting and bindery, and many other kinds of custom-made print services. Our equipment is located on site. That means shorter lead times and less cost for you. We can put your logo on almost any item you can imagine. 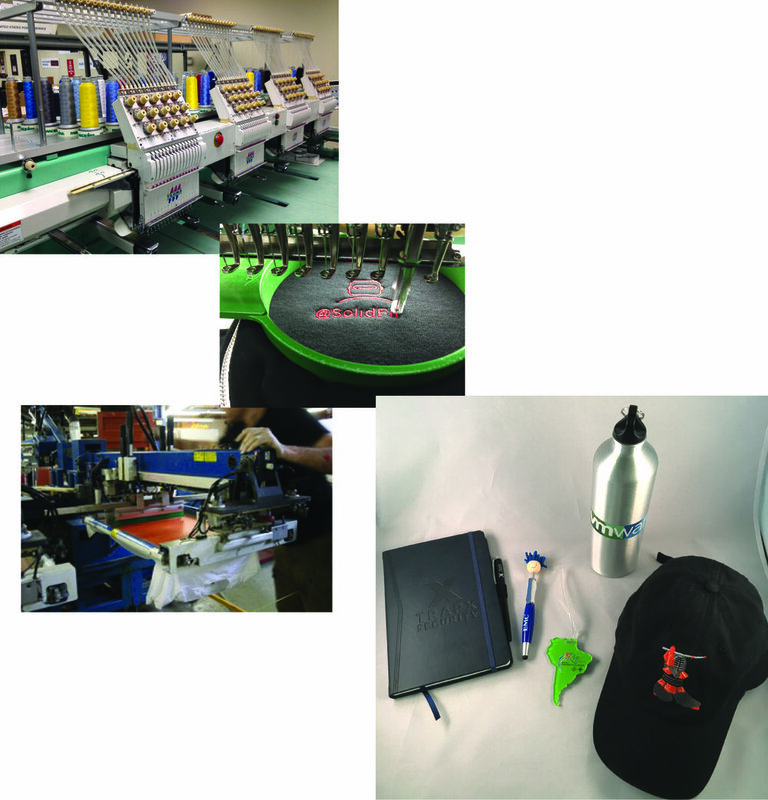 If it’s apparel you’re looking for, we provide in-house embroidery. Pens, coffee mugs and t-shirts are common items we recommend and source. We also enjoy working with our customers to produce custom items. We take great pride in our quick turnaround of urgent orders. If your items need to be used at an upcoming field event or trade show, they simply must arrive on time. We produce and deliver under tight deadlines all the time. Our modern printing equipment allows us to produce signs and banners of all types and sizes. If you need an easel-back 8” x 11” table signs for upcoming tabletop exhibits, we can make them. We can produce foam core and falcon board table signs in any size up to 4’ x 8’. We can also make the retractable floor-standing banners you’ll need at smaller exhibits. For large trade shows, we can help you get maximum visibility with vinyl hanging banners, booth backdrops and other exhibit signage. Our Mimaki printer allows us to print on almost any surface (except fabric) up to 48" x 96" and 2" thick. Need a logo or full color image put on an iPad or GoPro? We can do that! Don’t have enough space or workers to manage inventory, ship and receive your marketing materials? We’ve got you covered. Our main warehouse contains over 250,000 square feet of storage space. We can store and manage your inventory of marketing materials, and give you a link to an online system that gives you real time inventory levels as well as tracking and reporting. When you need your collateral, signage and promotional items shipped to an event, we can pick, pack and ship – most orders ship on the same day! Our partner, Big Up Marketing, can handle all your event management needs. They have successfully managed hundreds of events of all types and sizes, and can perform just about any logistical event task you want. They research, recommend and book event venues, order trade show services, register and schedule exhibiting staff members, transcribe leads from business cards, format and import leads to your CRM system and send out follow-up emails. They even provide graphic design services!